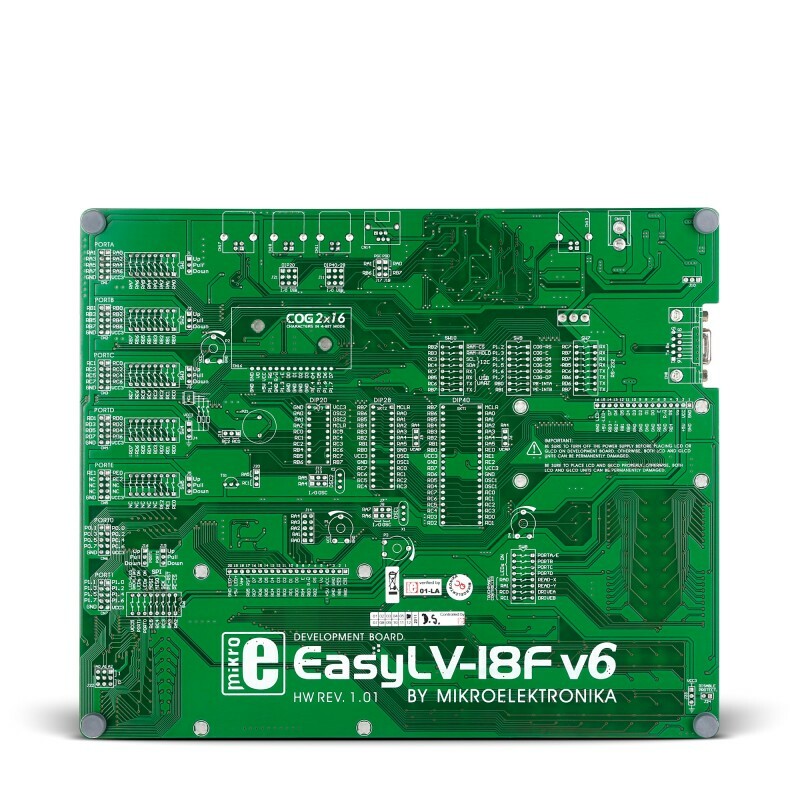 The EasyLV-18F v6 development system supports 40-, 28- and 20-pin PIC18J and PIC18K microcontroller families from Microchip. It comes with a PIC18F45K20. 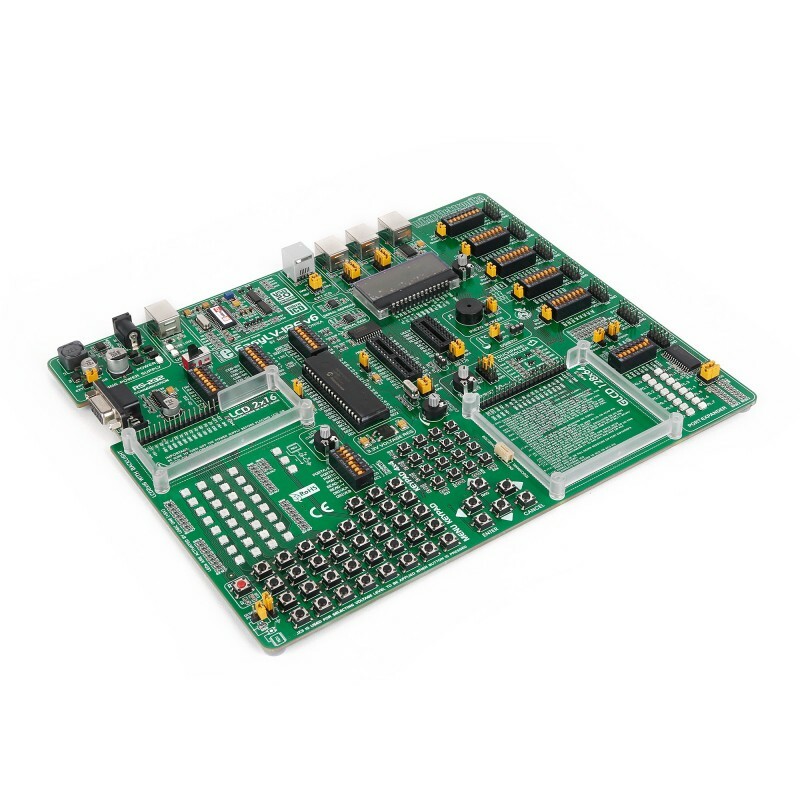 The system features a USB 2.0 programmer with mikroICD and many peripheral modules such as Serial RAM, EEPROM, COG Display, etc. On-Board USB 2.0 programmer with mikroICD (In-Circuit Debugger). mikroICD is a highly effective tool for Real-Time debugging at hardware level. 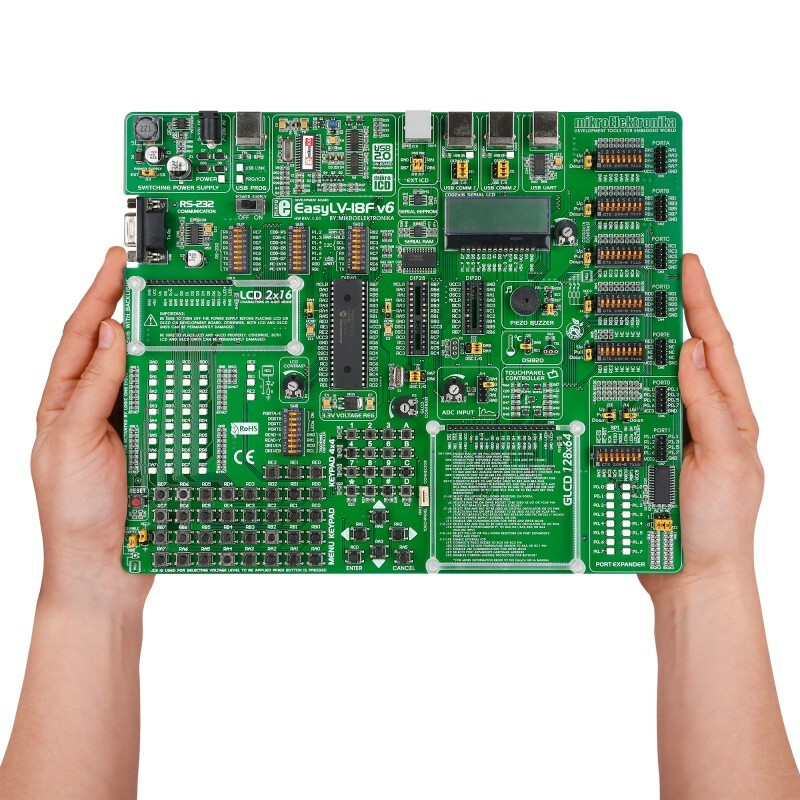 It enables you to execute mikroC, mikroPascal and mikroBasic programs on a host PIC18J or PIC18K MCU and monitor variables values, Special Function Registers (SFRs), RAM and EEPROM memory modules while the program is running. There is also an ultra fast USB 2.0 programmer that supports a wide range of PIC18J and PIC18K MCUs. PORTs, buttons and LEDs. 70 push buttons and 70 LEDs are connected to all microcontrollers pins. DIP switch is used to separate port pins from pull-up/pull-down resistors. 2 potentiometers are provided for testing multiple A/D conversions. Inputs can be configured via jumpers. Displays and Touch screen. Graphic LCD 128x64 and LCD 2x16 can be easily connected via the on-board connectors. Board also features a Touch Screen controller. On-board 2x16 Character COG Display is connected via Port Expander. RS-232 communication is enabled via DB9 connector and MAX232 level converter. USB UART module features the FT232RL interface between a USB device and the microcontroller. USB communication connectors are available for microcontrollers with USB facilities. 16-bit I/O port expander MCP23S17 enables you to add more inputs or outputs. RAM, EEPROM, Buzzer, Temperature sensor. 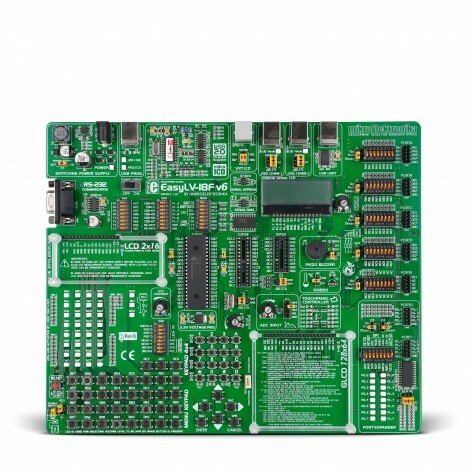 Board features Serial EEPROM Module 24AA01 which can store up to 1Kbit of data and uses I2C communication and 64Kbit Serial RAM 23K640 with SPI interface. Piezo buzzer enables sound signalization, while temperature sensor DS1820 measures temperature from -55°C to 125°C. It is connected to the system via 3-pin socket.